Ooh, ahh! Luxurious faux fur you can wear everyday. The style of this sleeveless duster seems to downplay the formality of "fur," making it wonderfully wearable day or night. Layer it over a t-shirt and jeans, a sweater dress or pencil skirt. Pair it with knits, flannel, cashmere or silk. 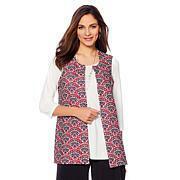 You'll find it's easy to create sophisticated outfits and bohemian looks with this versatile vest. Awesome choice. I would buy more. Fits true to size. Perfect for the cold office. Received many compliments. I really love my Slinky faux fur long duster vest. I have one in black and brown. I wear indoors and out, it makes me feel cozy and safe. Something about being wrapped up in a luxurious but light faux fur, I feel glamorous. I really love the light weight, it makes it drape beautifully! Absolutely beautiful. Soft and luxurious! This vest is just perfect to wear with almost anything. I love it! Very nice comfortable and very soft, great job in making this vest. The only thing missing is pockets. I am so glad that someone at Slinkly thought of this. When I first put on this vest, I did not want to take it off; it is just that comfortable. And SO STYLISH!